How do we know if anything is real? What is considered reality is what is agreed upon by most, such as gravity. Yet consensus does not always mean that something is real. Plato argued about the shadows on the cave and the subjectivity of representation. Art is always representation and this means, to some degree, art is never the real thing. 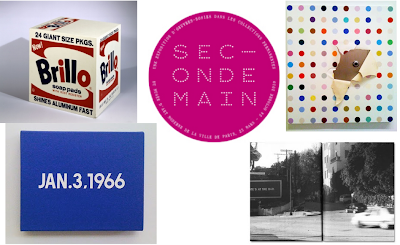 The idea of art and authenticity was originally vary vague. Around 500 BC decorated vases began to be highly traded in Greece and the creators marked their work by name, establishing authenticity. Amasis painter and Ekekias were the first to sign their pottery, seen below. The naming has made their vases the most highly valued in museum collections today. Signing paintings did not become popular until much later, at the time of Giotto in Italy in the 14th century. Later Italian writer Vasari coined the term Renaissance and wrote about the lives of artists, making Michelangelo and Da Vinci famous and encouraging them to use their names. 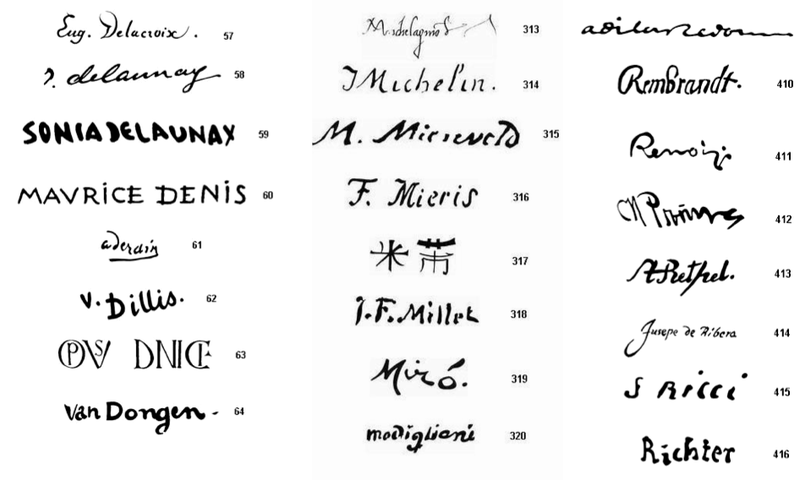 See the archive of artist's signatures here. 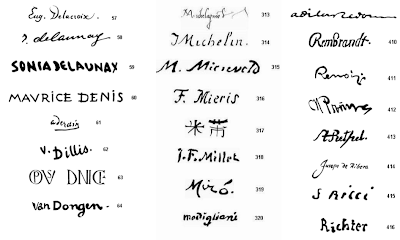 Certain artists have been associated with copies. Rembrandt had a large studio who regularly copied his work. As a result there were at first thought to be 600 Rembrandts in museums, which more recently was reduced to 300. Dali was also associated with copies when a truck in the Spanish mountains was discovered full of signed blank canvases. Like Rembrandt, Dali also had assistants who made works, most notably Isidor Bea who claims to have created all of Dali's large scale works. Read more here. The Last Supper by Dali or Isodor Bea...? 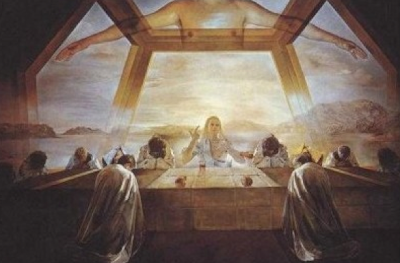 Below the Dali's work Christ St John of the Cross has been the subject of a major copyright battle. The museum, which profits from reproducing the image on postcards is suing many companies that reproduced the image on souvenirs and album covers as below. The museum seemed concerned about the work of art in the same way a fashion company is concerned about it's brand. They stated "It's an issue of the image being reproduced in an appropriate manner. We don't want to see tacky goods having the image on them." Read more here. 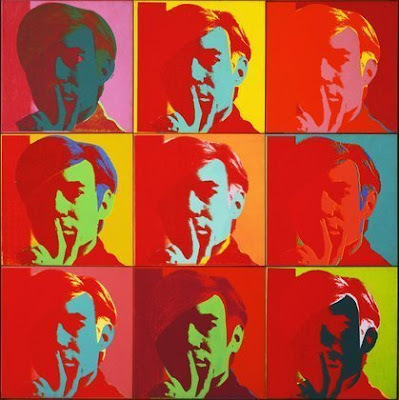 Warhol used reproduction as a basis for his work, making many works in series. A version of the self-portrait below from 1967 sold in February 2011 for 17 million. 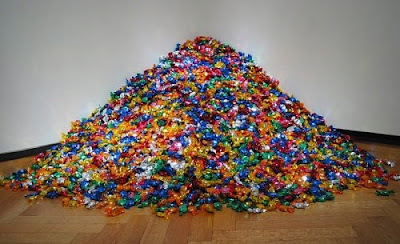 Below artist Felix Gonzales-Torres made works of art out of mass produced objects, that in many cases could be taken away part by part by gallery visitors such as the candy below. Street art is often anonymous and it's gesture of imitation is overlooked. However since street artists have become more popular with recognizable tags and names their work is under scrutiny. 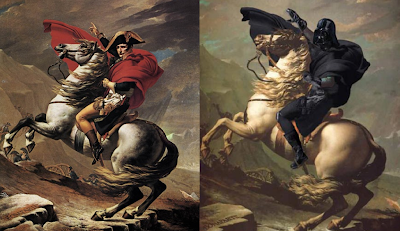 Both images below, left by Shepard Fairey and right by Mr. Brainwash, were based on photographs and the artists were sued for the reproductions. Like fashion, there are also many art works inspired by originals, such as below. What is interesting about the copy above by David LaChapelle, and below by Star Wars fans, is that while Benjamin argued that the copy reduces the aura of the original due to connection to context, here we get a new relevancy. 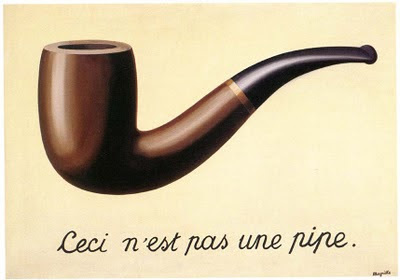 The original art is changed in such a way it makes sense only to the contemporary audiences. Copyright covers the form of something (a printed version, an image) but not the idea. The form is protected in the US for the life of the creator plus 70 years. 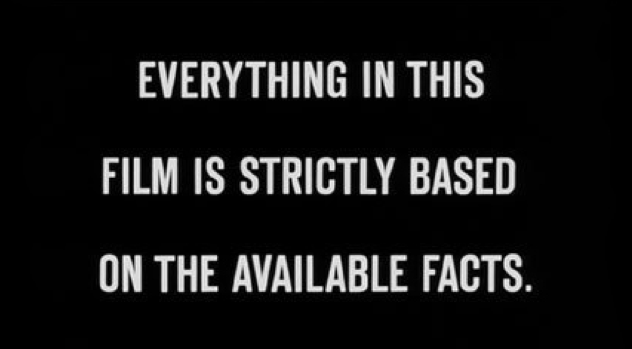 There are many allowances for fair use (such as teaching and creative adaptations) and the law is intentionally gray to allow case by case judgements. The most common cases concern images reproduced for profit. Last year the modern art museum in Paris hosted an exhibition featuring only creative copies of iconic original works of art. See more here. 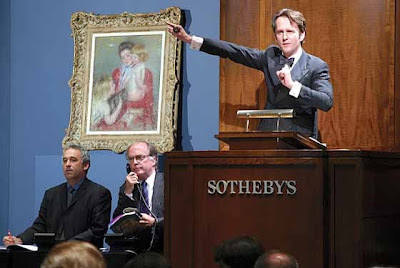 The authorities on authenticity are the auction houses Sotheby's and Christie's. The two houses manage blue chip investment art and have divisions for assessing art authenticity and value. 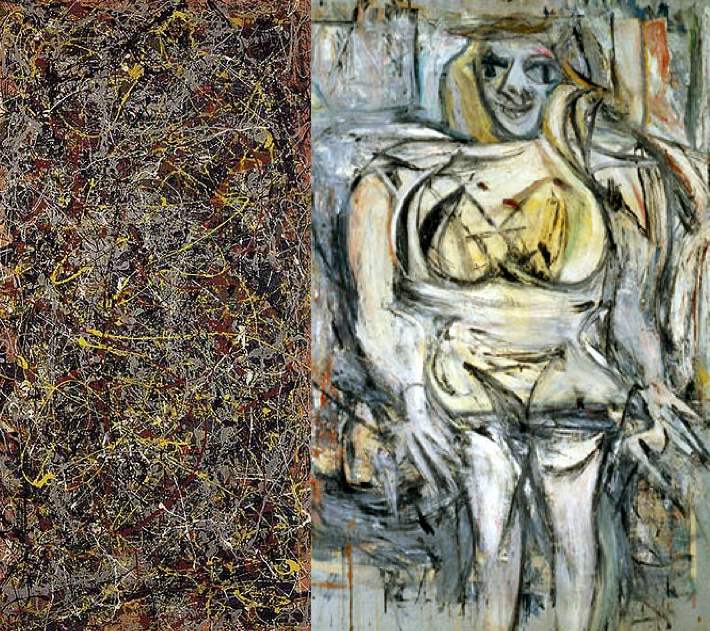 The highest valued pieces sold are $151 million, Jackson Pollock, No. 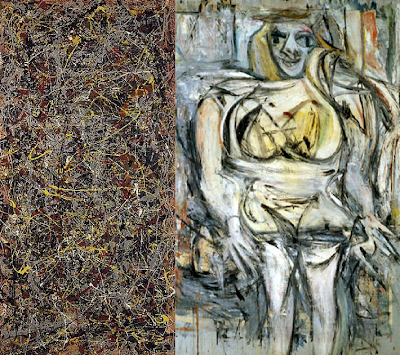 5, sold through Sotheby’s and $149 million, de Kooning, Woman III, sold through Gagosian. Christie's recently launched the first branded authenticity division. 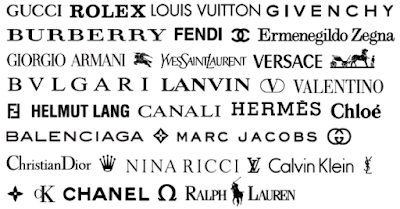 The Gucci Collector site provides value assessment and sales management. 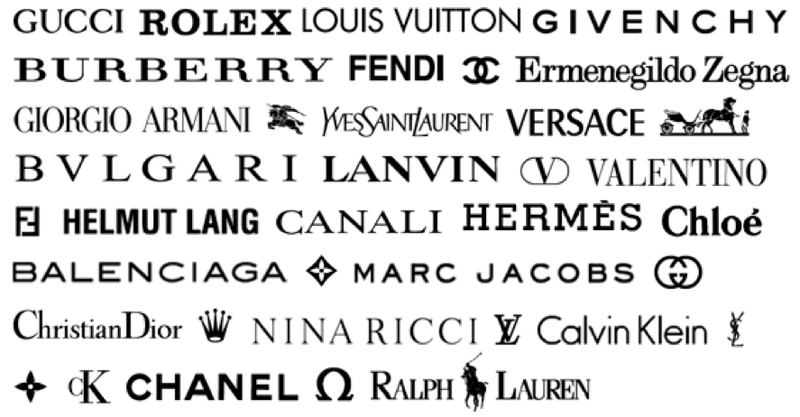 Below the fashion brands function like artist signatures and all evoke different auras. The auras have become ideas of their originality, their personalities so to speak, more than any tangible aspect. 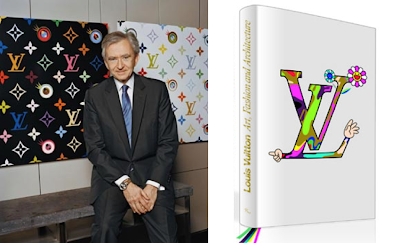 Louis Vuitton has been presenting art along with fashion which some suggest has commercialized the work. 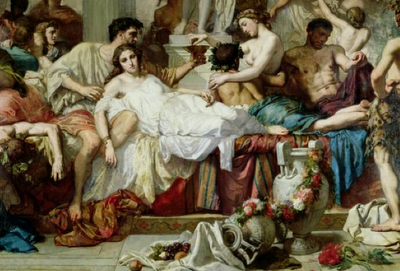 The art as a real thing becomes art as an instrumental thing, to promote the values of the luxury house. One of the most interesting investigations into art and the real was F for Fake by Orson Welles. Below art forger Elmyr de Hory with his biographer Clifford Irving. See an explanation of the film here.